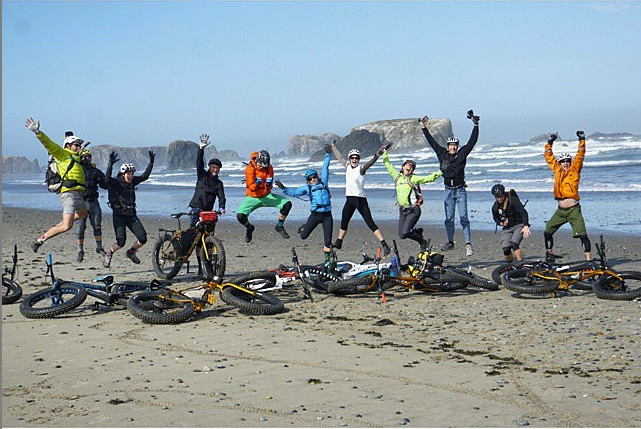 Home » Cog Tours » Fat Biking Adventures on the Oregon Coast: Coming Soon! Fat Biking Adventures on the Oregon Coast: Coming Soon! Clam chowder, sand dollars, bald eagles and fat bikes. That’s right. 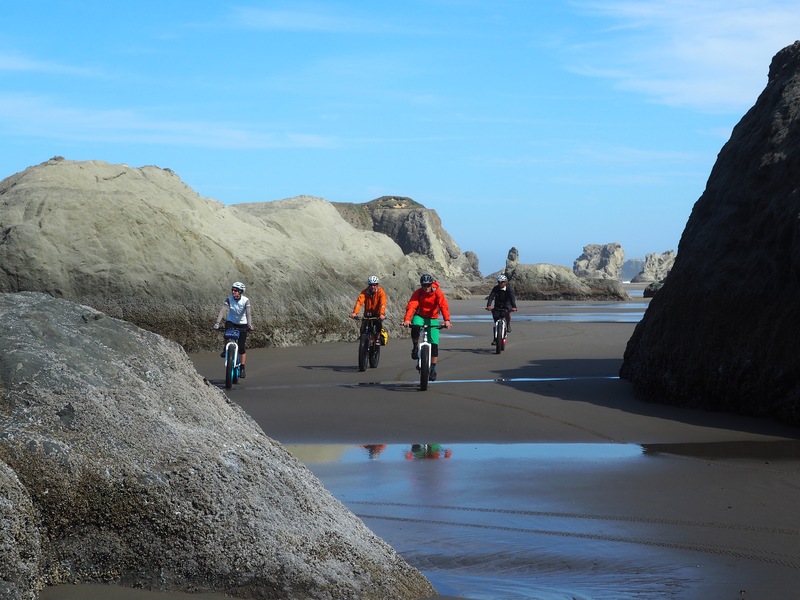 We are excited to offer a new and different tour—a fat biking adventure on the amazing Oregon coast. This is something we have wanted to do for a long time and it’s finally coming together! The Oregon Coast boasts 363 miles of beautiful and rugged coastline, and fortunately for us, every inch of it is designated as public land, available for anyone and everyone to enjoy. That’s why we like to call it The People’s Coast. Not only that, it offers stunning scenery, friendly towns and lots of adventure—all the stuff that our guests get to enjoy on our mountain biking tours. Oh, and beer. Because what is a bike ride without a frosty craft beer waiting for you at the end? 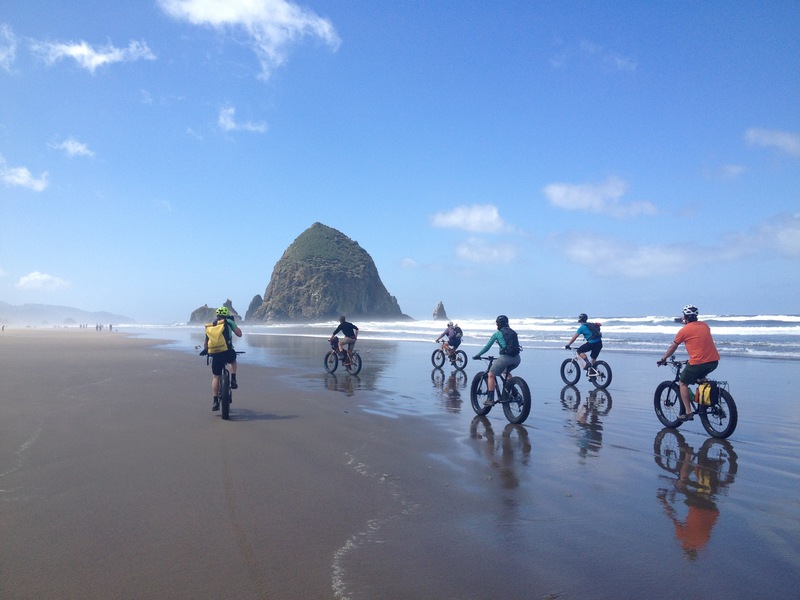 We spent an awesome five days with Travel Oregon scouting out places and routes, opportunities and eateries, and the best of what you might see on one of our upcoming Oregon Coast Fat Bike Tours. Read along for a recap of our tour. There’s always a good reason to jump for joy at the coast! Our biggest lesson for Day 1: Fat biking the Oregon Coast is a one-way affair. Most of the time on the coast, the wind comes from the north and sweeps side shore in a southerly direction. This means, we’ll be organizing our tours to go north to south for a nice tailwind—yes please! We immediately sought out expansive stretches of beach with nice flat, packed sand to cruise on. While the fat bikes can and will go in softer sand, having a smooth and tacky route right along the water’s edge makes for very enjoyable riding. This southern section of the coastline featured the mouth of the Wild and Scenic Rogue River, the quaint town of Gold Beach, long stretches of open beaches, and an adventurous river crossing. Not to mention Melanie’s first of seven taste tests of clam chowder. By the end of the trip, she was the total expert on Oregon Coast clam chowder! Dinner at Tony’s Crab Shack in Bandon, piping hot showers and camping at Bullard’s Beach State Park and a round of Deschutes Brewery beers capped off the day. Can you say A-Mazing? Day 2 definitely had a few a-ha moments as we cruised from Bandon south to China Creek. 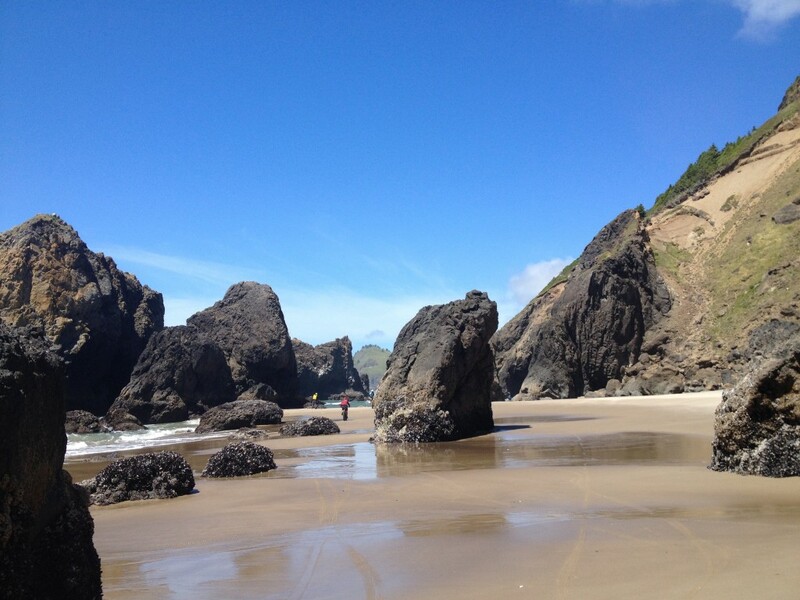 Led by Karl of South Coast Bicycles, we were awed by the beauty of sea stacks and pinnacles that rose up both on the beach and out in the ocean. Like little kids, we rode in circles through slot canyons, sea caves, arches, and rock formations formed from thousands of years of wind, water and weather. Wildlife included seals eyeing us curiously from the rocks, seabirds, and tide pool critters. Approaching our take out at China Creek, we had the opportunity to learn about Snowy Plovers, a threatened beach nesting bird. For several months out of the year, some stretches of sand are closed to protect the birds during their nesting season. Our afternoon was sheer fun in the Oregon Dunes National Recreation Area—the largest expanse of coastal sand dunes in North America. Imagine opening it up on a steep downhill with nothing but a soft landing if you tip over or crash. We’re pretty sure we invented a new sport – DuneDuro! Fortunately all of the Oregon State Park Campgrounds have excellent hot showers to get the sand off. Whew! We made it about halfway up the coast to Florence, were we started our morning ride at the South Florence Jetty. Today’s adventure included a mix of fast hard packed sand along the water and some more adventuring in the dunes as we navigated our way to our take out spot. We found all kinds of good stuff sliding our way through fluffy sand and splashing through creek crossings. The fishing town of Newport was a welcome stop for the night, complete with the very community-oriented Newport Bike Shop and one of Oregon’s most popular breweries, Rogue Ales, under the majestic Yaquina Bay Bridge. From our camp at South Beach State Park Campground, we rode a sweet little path to the brewery, then caught the sun setting from the vantage point of the South Beach Jetty. A fun ride back to camp on the beach at dusk was a perfect way to end the day. 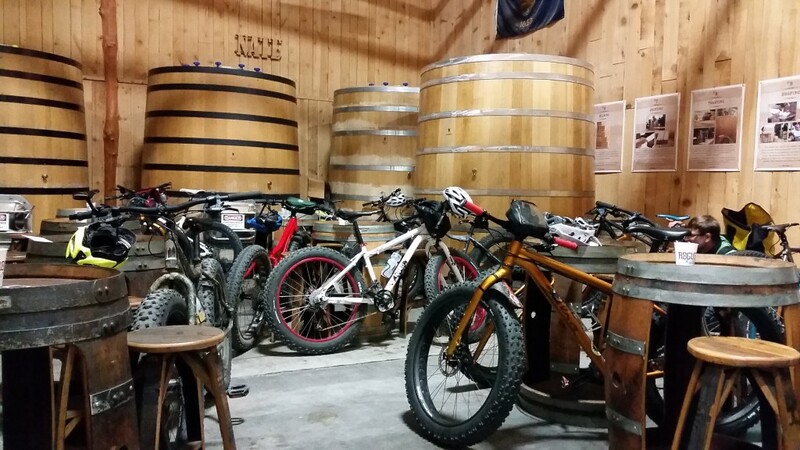 Our bikes got VIP seating too at the Rogue Brewery in Newport. North of Newport, much of the coast is a series of large headlands and capes that jut into the ocean, resulting in stunning, post-card-like scenery. From Otter Rock to Newport, with a short section of pavement in the middle, the beach was more of the hard packed sand that is so fun to cruise on a fat bike. Small creek crossings, the occasional rock outcropping and more of the blue ocean flanking us the whole way made for a great day. We had a lot more to cover that day, so onward north we headed, to Lincoln City for some incredible scenery around Roads End State Park. We felt like we momentarily left Oregon and entered another world. Check out some video footage of this amazing area. Sometimes, you just gotta go around the corner to see what is there. The last leg of the day had us exploring the areas between Cape Lookout and Cape Kiwanda, including an adventurous crossing of Sand lake and a sand dune descent, ending at the Pelican Brewery & Pub in Oregon’s surf city, Pacific City. Ahhh, time for a beer and hearty meal! And more chowder. Our group looked only slightly weary after four days of riding, but quickly perked up as we set out on the sand at the quaint town of Cannon Beach and rode south, skirting Hug Point and on to Arch Cape. A seriously spectacular stretch of coast with deep green, forested hillsides on one side, and the iconic Haystack Rock and other sea stacks on the other. We came so far on our adventure, but we just had to scope out the very most northern beach in Oregon, from the Astoria South Jetty at the mouth of the Columbia River, to the little town of Gearhart. This 16-mile stretch of white sand was dotted with hundreds of sand dollars—the trick was to find an intact one to take home! After nearly 100 miles of fat bike riding, we loaded our gear into our sag wagons for the last time. Reminiscing about the long stretches of solitude, our Duneduro shenanigans, and the seven cups of chowder that Melanie “tested” (ask her about the findings), we reminded ourselves how luck we are to live in beautiful, rugged and quirky Oregon. We’re excited to take you along next time. 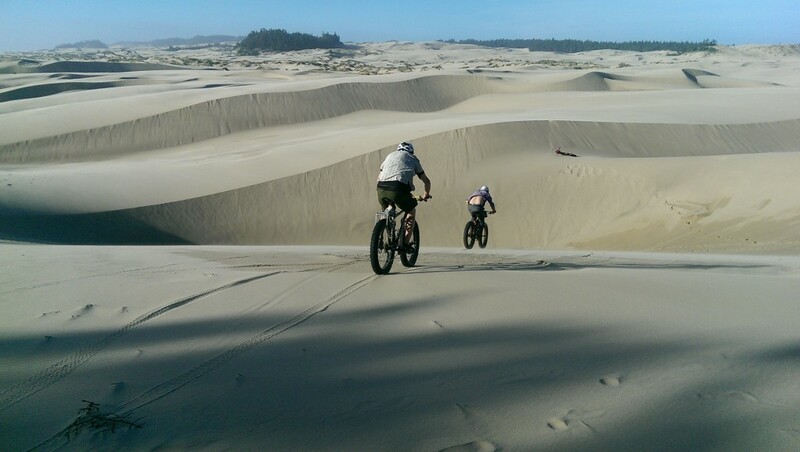 Our tours will include days filled with fun beach and sand dune riding, healthy and delicious meals, Oregon beers, and overnights in either hotels or Oregon State Park campgrounds. And the winner of the chowder chomp-off: Rogue Brewery. Stay tuned for more information about upcoming coast fat bike tours. Sign up for our newsletter to be notified or contact us directly to get on the list. This entry was posted in Cog Tours. Bookmark the permalink.